As the controversy about the media telephone hacking rumbles on, I occasionally look at a poignant cartoon which I cut out of one of our national newspapers. The cartoonist pictures a starving Somali refugee who, clasping his telephone, demands an inquiry into whether his phone had been hacked. It was an acerbic reminder of our disproportionate sense of priorities. Paradoxically, though, we would also know little of the Somali’s plight if it weren’t for our maligned media. And good journalism can require courage, bravery and even the ultimate sacrifice. I have to hand a cutting from April last detailing the death of photojournalist, Tim Hetherington, killed in Libya while reporting the struggle of the opposition forces as they fought against the forces of Colonel Gadaffi. Tim was educated at Lancashire’s Stonyhurst College. His bravery is comparable to that of the seven former pupils of his school who were awarded the Victoria Cross, having courageously lost their lives in the service of their nation. In 1999, an earlier Stonyhurst-educated journalist, Christopher Wenner, stayed behind in war-torn East Timor, when most westerners had left. His work led to the Rory Peck Award – for bringing the plight of the East Timorese to world attention. Risking, and even giving your life, to ensure that the world knows what evils are being committed against the innocent is journalism of the highest order. Frontline reports from Libya, Iraq, Afghanistan, and from the famine riven territories of East Africa remind me of the high calling of journalism. .
It’s as well to keep in mind such heroism. It isn’t healthy for a democracy when politicians and newspaper proprietors, their editors and journalists, are literally in each other’s pockets, but it is even unhealthier when politicians can control the appointment of a journalist or affect their career prospects, depending on how compliant or difficult the journalist has chosen to be. Just like politicians, newspaper owners have often begun with high ideals and good intentions. The trick is not to become so sucked in by the system that you entirely lose sight of what motivated you in the first place. When Rupert Murdoch was giving his evidence to the House of Commons Select Committee. I was struck by his description of how his father, having bought their first newspaper in Australia, had broken the story of the slaughter of young Australians at Gallipoli – an account which our First World War Government in Britain certainly wished to suppress. At their best, our newspapers, including Rupert Murdoch’s, continue in that tradition. Some risk their lives to do so. It was a Murdoch newspaper, The Times, which at the beginning of the summer carried the very last photographs taken by Tim Hetherington at Misrata. For Catholics, and from another age, I guess that G.K.Chesterton personifies the attributes which make for a great journalist – fearlessness, courage, originality, spontaneity. 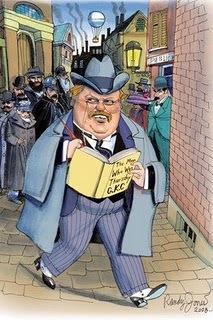 I read that some folk would like to see Chesterton canonised. I suspect that I can hear a mirthful guffaw from the big man but if St.Gilbert were ever raised to the altars he would doubtless become the patron saint of journalists. GKC’s thoughts on journalism still have plenty to commend them. And Chesterton, had seen, in the First World War how journalism could so easily become propaganda. Five hundred years before Christ the Greek tragic dramatist, Aeschylus, asserted that the first casualty of war is truth – so nothing new there then. But Chesterton was also deeply embroiled in seeking to expose the cat’s cradle of political corruption involved in the Marconi Scandal and he used journalism to shine a light into dark places. He could be very critical of the way the media attempted to fashion men’s thoughts and beliefs but he also knew that the asphyxiation of the press was the prelude to totalitarianism. “There never was a power so great as the power of the Press. There never was a belief so superstitious as the universal belief in the Press. It may be that future centuries will call these the Dark Ages and see a vast mystical delusion spreading its black bats’ wings all over our cities.” He warned that “knowledge is now a monopoly and comes through to the citizens in thin selected streams.” His appeal was for a thoughtful and literate press that refuses to tell lies – and one which more accurately reflects what is normal and good in society. And here’s a small example to bear out Chesterton’s complaint. With my university in Liverpool I run a Good Citizenship award scheme. Awards are given in just under 1,000 schools throughot the North West of England. The awards celebrate the achievements of some terrific, normal, young people – doing some outstanding things – everything from saving lives to raising funds for charity – representing hundreds of hours voluntarily given in selfless activity . Occasionally one of the stories will make it into a newspaper. Mostly, they are ignored. By contrast, when the court reports land on the journalist’s desk they make the news. Chesterton’s complaint was that newspapers seem unable to report that Mrs.Smith has not been mugged, that Mr.Jones has not been burgled, that Mr and Mrs.Green’s family has not broken up, that Miss Brown is neither a drug addict nor an alcoholic. In these times of endless bad news some truthful reports celebrating what is good might lift our spirits. Chesterton argued – and I would agree – that there is an appetite for “good news stories” and that it would be healthier for society if our journalists spent more time looking for these rather than the obsession with what is negative and destructive; or, today, in hacking people’s phones attempting to expose people’s private lives or in the creation of a celebrity-obsessed culture. I began by remarking on the cartoon of the starving Somali refugee clutching a mobile phone and demanding an inquiry into whether it had been hacked. While MPs have been pouring over the allegations of telephone hacking it’s worth remarking that generosity and goodness have been stalking Britain’s streets. Despite austerity and economic gloom the British public’s response to the plight of the Somali famine has been remarkable. Now surely that’s something to write home about.